cat eyes & skinny jeans: Mary Jo Matsumoto Brings Fall to Your Fingertips! 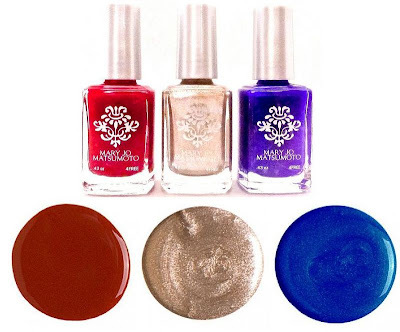 As you may remember from my post back in December of 2011, I am a HUGE fan of Mary Jo Matsumoto’s 4FREE Nail Polishes, so I am super excited to announce her Fall 2012 Collections – the Caffeine Addiction Trio and the Laguna Libertine Trio; both of which I feel were created for me because one pays tribute to all things caffeinated (hello, Café Fashionista! ), and the other features a color (Wilde Blue Yonder) that pays homage to one of my favorite people in history – Oscar Wilde! Caffeine Addiction features three seriously fall-hued colors – Vanilla Latte Gratification (a taupe shimmer), Coffee Addiction (a soft caramel color), and Mood-Altering Mocha (a dark chocolate shade); while Laguna Libertine is a bit brighter, and perfect for the summer-to-fall transition featuring Wilde Blue Yonder (a royal / cobalt blue with subtle shimmer throughout), Bon Mots (an effervescent gold metallic), and Scandalous Lover (a brown-based vampy red). Both Trios retail for $36.00. Out of the six colors, I think my personal favorites are Coffee Addiction, Vanilla Latte Gratification, Mood-Altering Mocha, and Bon Mots. Vanilla Latte Gratification and Bon Mots would work perfectly as accent nails (usually the ring finger) against darker-hued manis – I’d love to see (or try!) a Coffee Addiction manicure using Vanilla Latte Gratification as an accent nail. I also think that Bon Mots would look stunning as a Reverse French Mani with either Mood-Altering Mocha or Scandalous Lover (i.e. using Bon Mots for the tips of each fingernail, and one of the darker shades for the nail beds). As you can probably tell from my NOTD posts, I use a TON of different nail polish brands - from high-end to drugstore offerings. From my experience, the formula for Mary Jo Matsumoto's lacquer collections is comparable to Essie and OPI; and is incredibly long-lasting, and usually opaque in just one coat - thus the reason why it is one of my favorite brands. 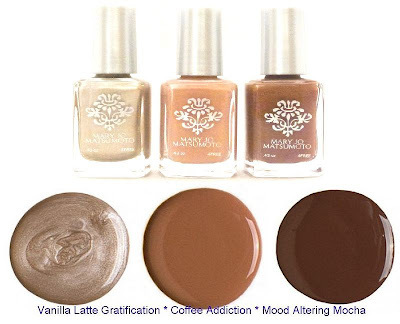 What shades do you love from the Caffeine Addiction and Laguna Libertine Trios? Are there any polish combinations you’d like to try using these colors? Love the mocha! These are such great combos. I would want them all. Such a sweet blue. I've embraced the blues this summer. I definitely need to investigate this product. Oh, so nice. So good to hear the review on this. I would definitely go for the caffeine addiction. I think the caffeine trio would be perfect for fall. Love these colors! Love these new trios, especially the second one! Mary Jo is the best! I love the caffeine addiction colors! I agree that they're very fall like...and are now tempting me for a return trip to Starbucks this afternoon! They are all so pretty! I love that blue shade. And long lasting with one coat? You've sold me! I really like the Laguna Libertine Trio, especially the Bon Mots shade. Also diggin' the Coffee Addiction color. These colors were made for you! These are such lovely nail colours. I love the autumn style colour palette. I love all three of the first set - so gorgeous! Erika, thank you for this wonderful review! I love how you explain the different ways you would wear the collection--you are definitely a Caffeine Addiction girl at heart! Hope you have a wonderful weekend and thank you again for your fabulous review! Woot, I love seeing fall inspired posts! Oh I do love those first three colors. I like the idea of fall coming. Awesome idea at the end that you mentioned..nail art. I must try! i also like that vibrant blue. it's so pretty.